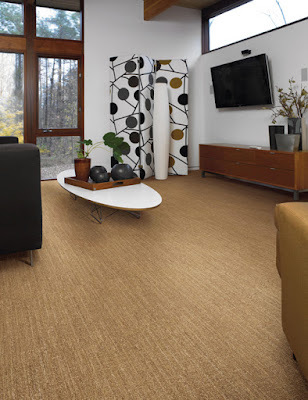 Carpet has always been the most popular floor covering choice at Indianapolis flooring store Kermans. It's interesting, however, to see what types of carpet are top of the request list. Berber? Plush velvet? Cut & loop? Right now, we have more customers than ever before asking to see our selection of patterned carpet. What is patterned carpet and why is it so popular? Let's ask the flooring design consultants at Kermans. "Design trends right now point to textures and a mix of colors," notes Kermans' Nichole Hansen. "Patterned carpets fit right in with these trends with their sophisticated, modern look." Patterned carpets can be bold or subtle. They can be traditional or modern. No matter what style fits you and your home best, you'll find a patterned carpet to match. Area rugs are another popular trend right now. They help you establish a layered, textural look in any room. If you want to add an area rug to your room, don't limit yourself to the area rug section of Kermans. Check out the patterned carpets. Kermans has the capability to make any patterned carpet into a custom area rug. Talk about creating your own unique look and feel in a room! Safety: or should we say soft landings? Carpet reduces slips and falls - an especially nice feature if you have toddlers in the house. Carpet also gives some comfort and traction to the four-footed members of your family. It's no wonder why Indianapolis homeowners want carpet in their homes. Want to see the latest trends in carpet while also shopping the best selection and prices in Indianapolis carpet? Stop by Kermans Flooring showroom in the Castleton area of Indianapolis. We'll be happy to show you patterned carpets that will be a great addition to your home.